It was a long cold winter in Toronto. It seemed like it would never end. Everywhere we looked at home was still grey and lifeless. 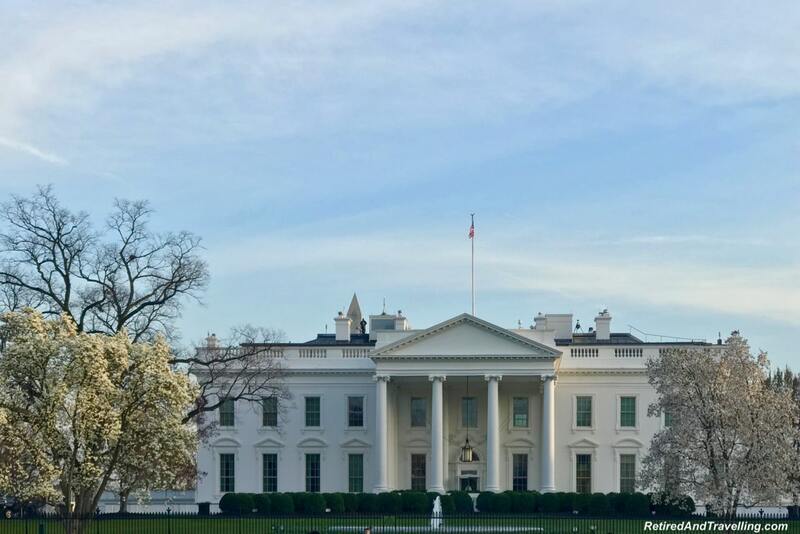 An extra long weekend in Washington DC at the end of March gave us a quick break before we headed to Central Europe for our long spring trip. We wanted to experience cherry blossoms in Washington DC. 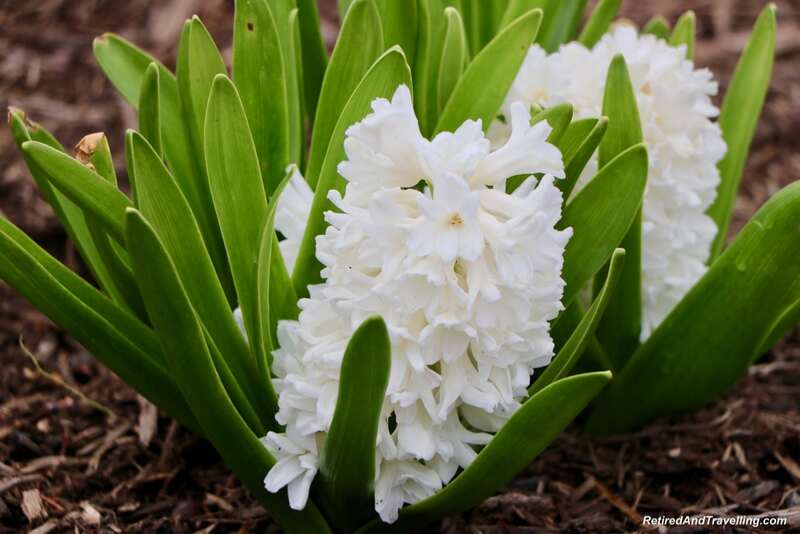 And make us believe that spring would soon come to Toronto! We went to experience cherry blossoms in Washington DC. But that was just the beginning. 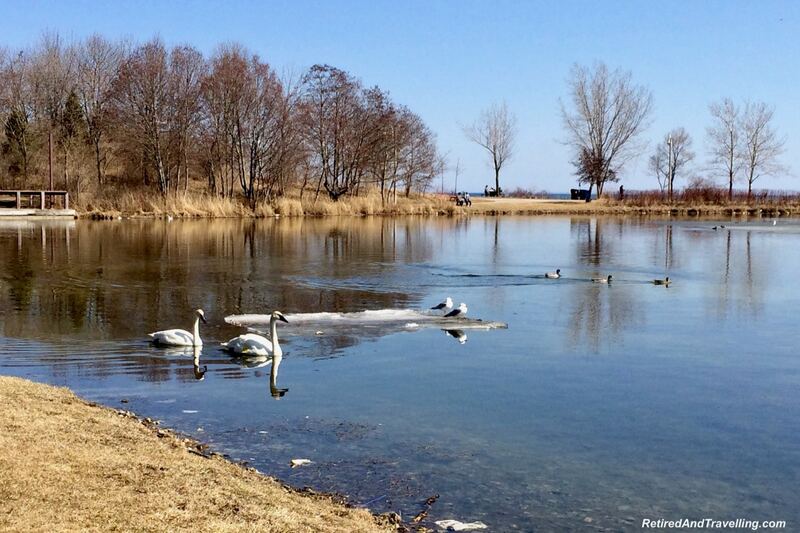 Spring was definitely well ahead of Toronto. Flowers were in bloom everywhere we went. 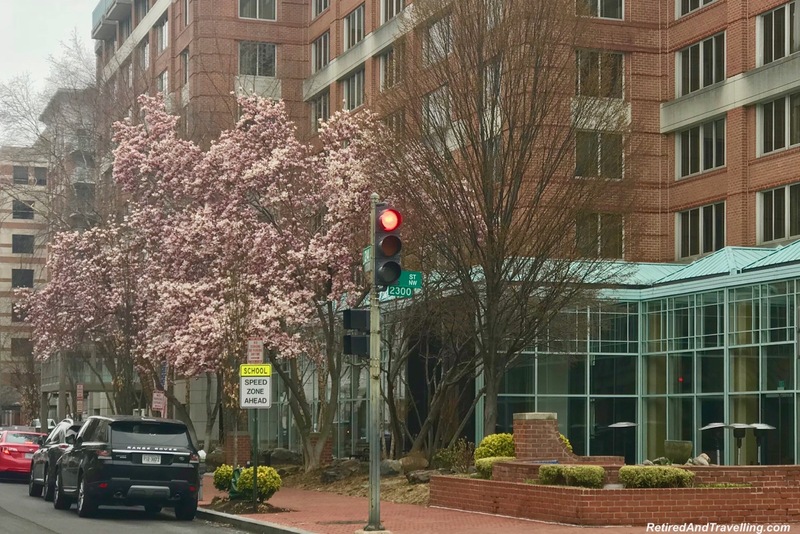 We got our first view of pink blossoms as we drove from DCA to the Westin Georgetown. It was not much, but we started to get excited. 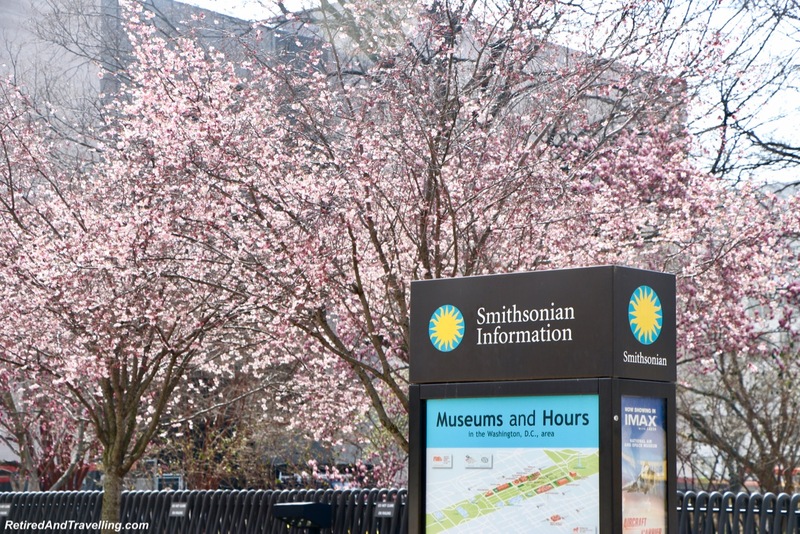 When we went to visit the Smithsonian, we saw much fuller blossoms as we got off the bus. Our optimism increased. 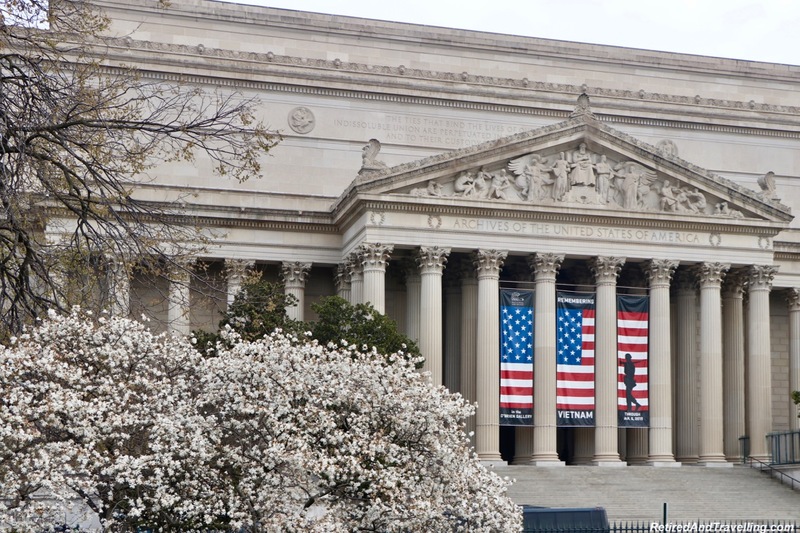 Throughout our 5 days in Washington DC, we saw a lot of trees in bloom. At first I thought they were all cherry blossoms. I later realized there were both magnolia and cherry trees blooming. I thought I could tell the trees apart by colour or by blossom size. 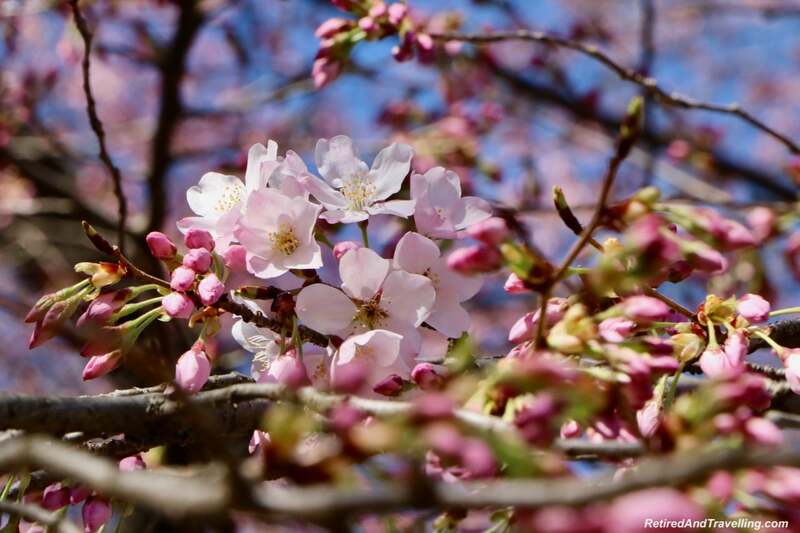 But I saw small white cherry blossoms, large bright pink magnolia blossoms and then small pink Japanese plum blossoms. I will apologize in advance if I am still a bit confused and have labelled them incorrectly. 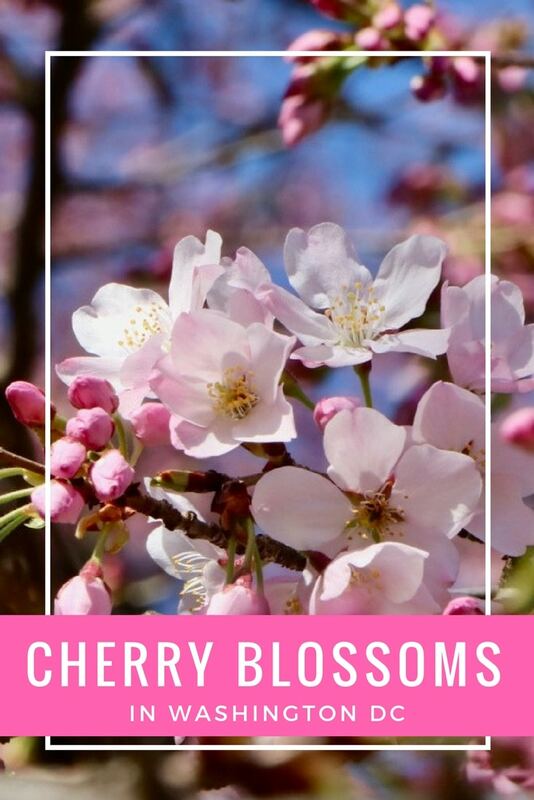 When we headed out to experience cherry blossoms in Washington DC, we got so much more. 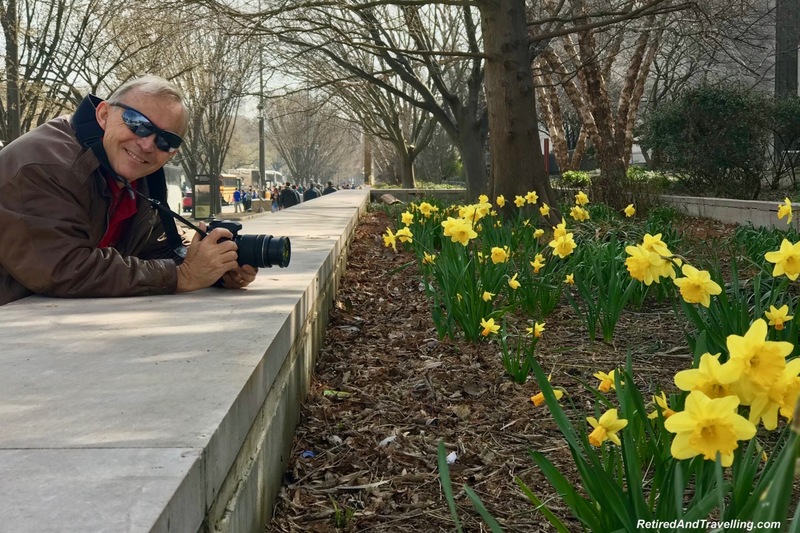 We wandered all over the city on our quest to experience cherry blossoms in Washington DC. We saw blossoms that added colour to every scene. 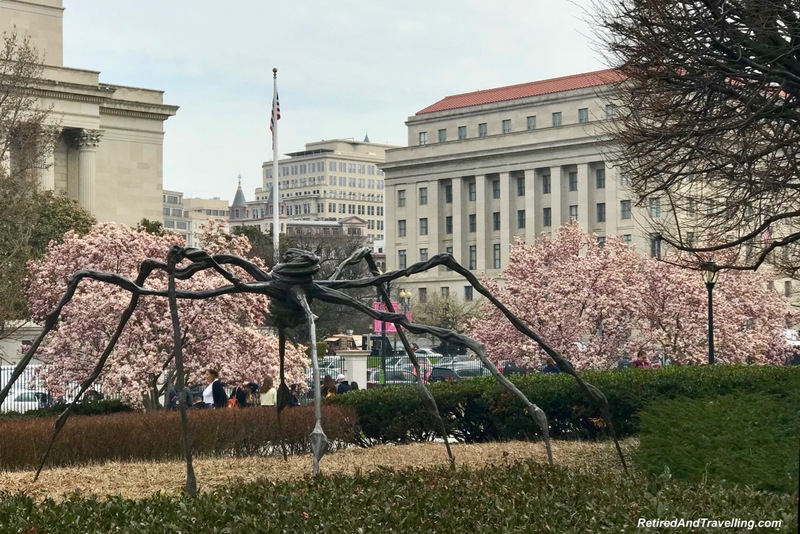 On our way to explore the Smithsonian Air and Space Museum, we wandered through the National Gallery of Art Sculpture Garden. 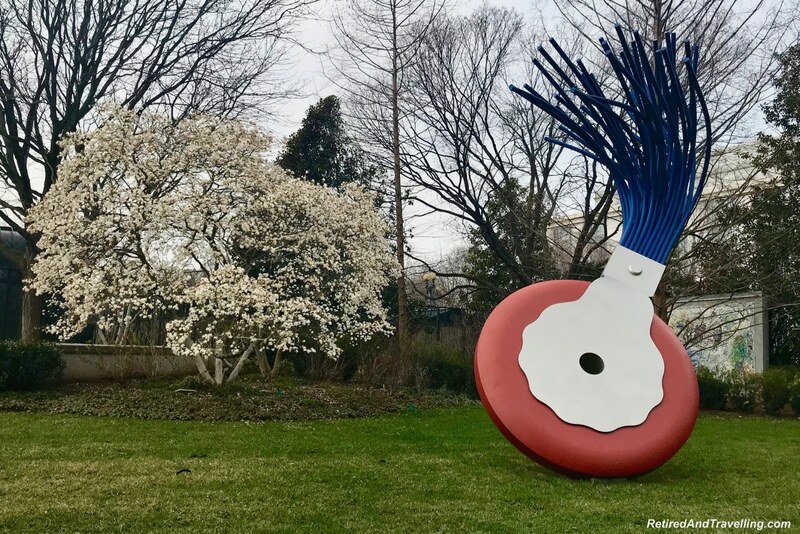 We enjoyed the NOMA outdoor sculpture gardens in New Orleans and the Vigelandsparken Statue Gardens when we visited Oslo, Norway. 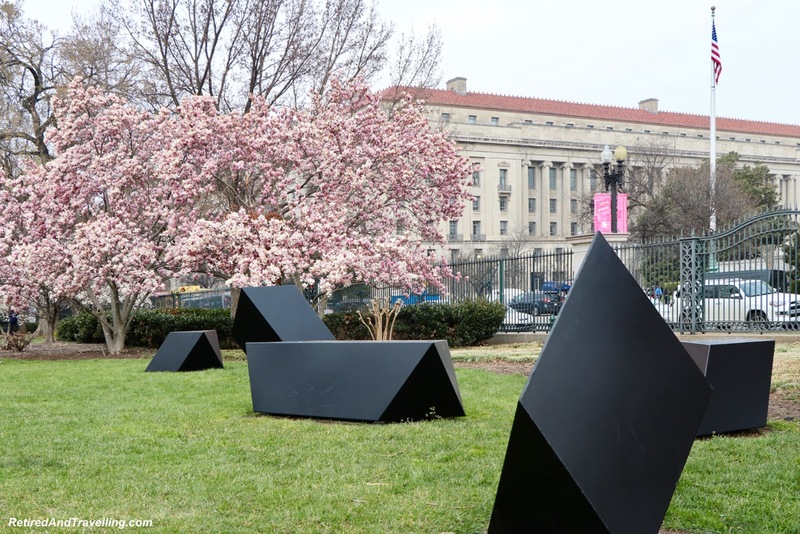 In Washington DC, we found the sculpture art in the garden accented by the trees in bloom. It was interesting to find similar pieces of art from the same artists over and over again. We have found the giant spider statue in Ottawa, Canada and then again outside the Guggenheim Museum in Bilboa, Spain. 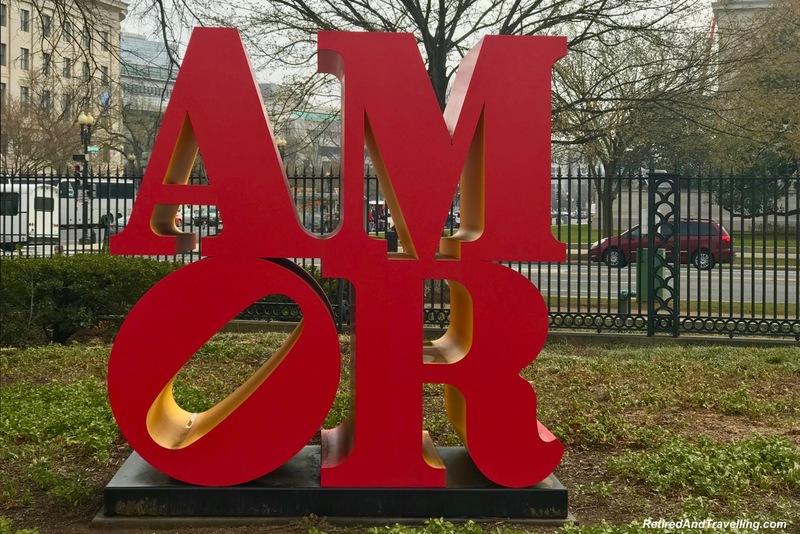 The “AMOR” sign reminded us of the “LOVE” signs found in many other countries. 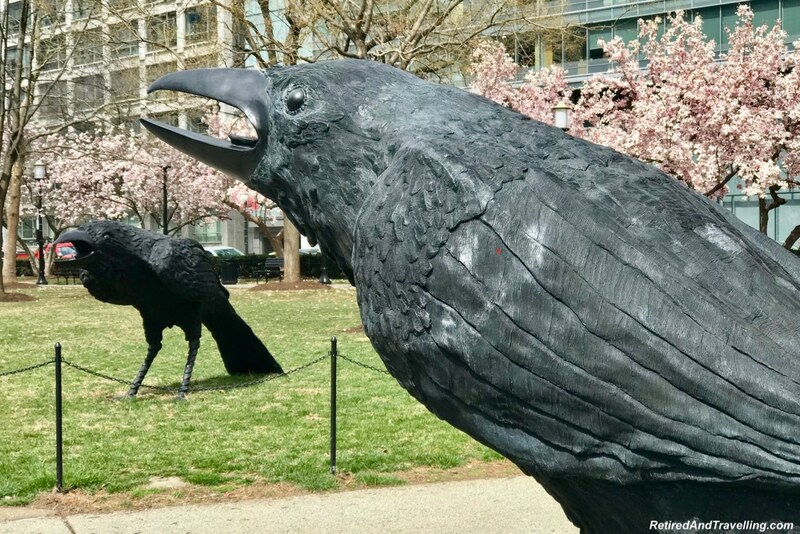 After we visited the Burning Man “No Spectators” Exhibit at the Renwick Gallery, we did the walking tour to see other outdoor pieces of exhibit art. Even this artwork was set amidst the flowering trees. 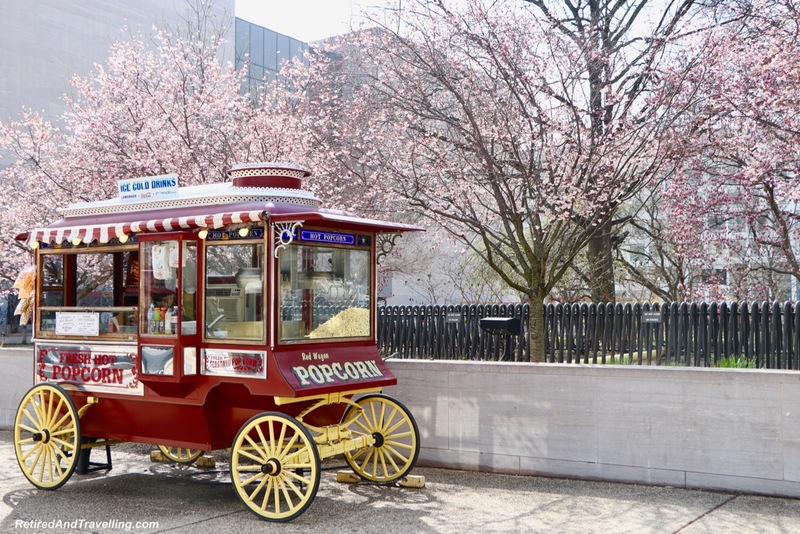 To experience cherry blossoms in Washington DC, we just needed to wander to different parts of the city. 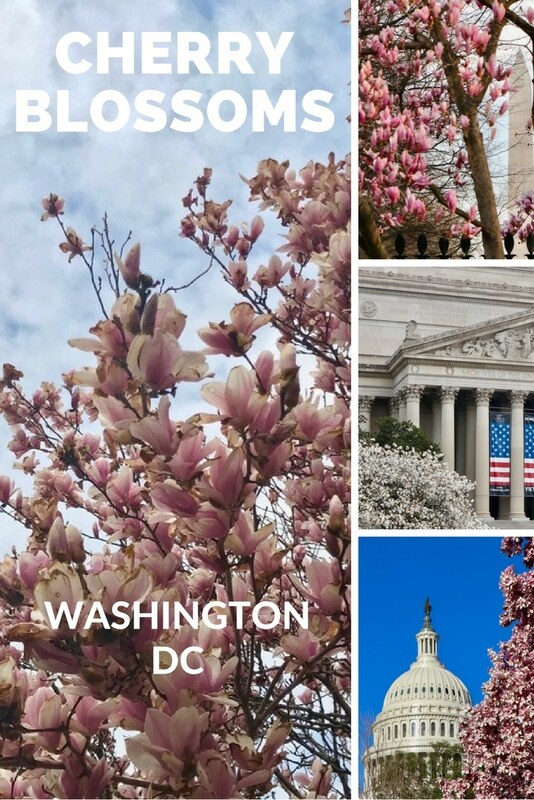 It was very interesting to see the blossoms accenting a wide variety of buildings in Washington. But it was quite moving to see the blossoms as they set off the iconic Washington monuments. 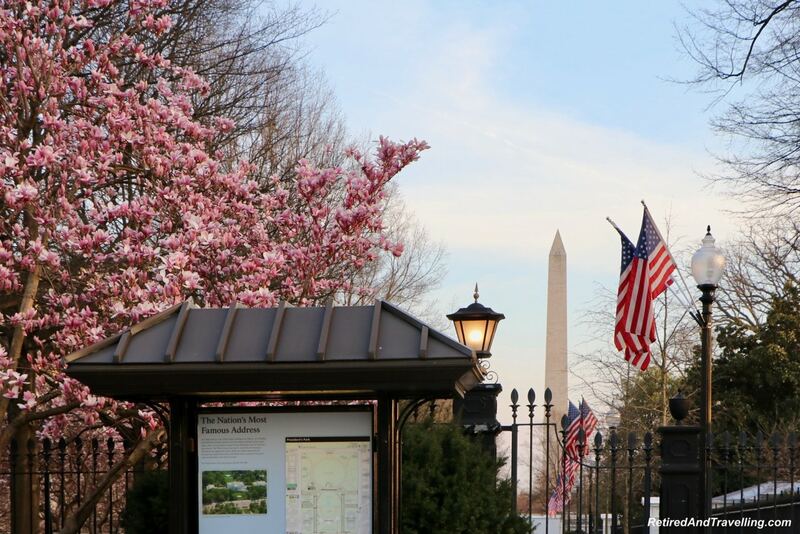 You will know exactly where you are when you experience cherry blossoms in Washington DC! Everywhere we walked we found cherry blossoms as the background for selfies. But we really wanted to get an up close look at the blooms. 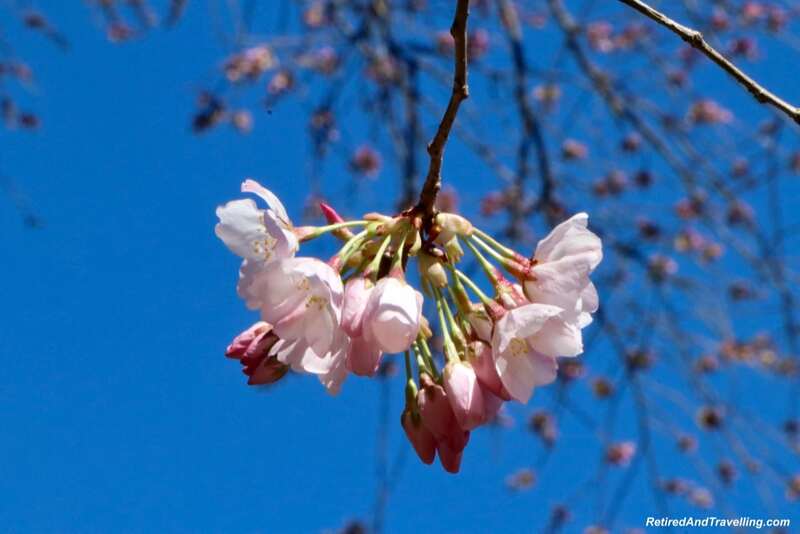 We loved the pics we got of blossoms against the clear blue skies or highlighted by puffy clouds. We never tired of taking yet one more angle. 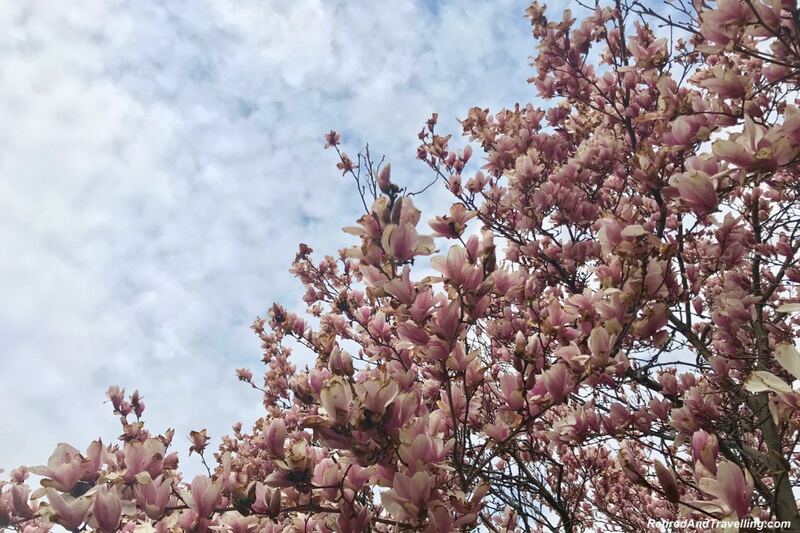 Did you really experience cherry blossoms in Washington DC if you don’t have them posted to Instagram? 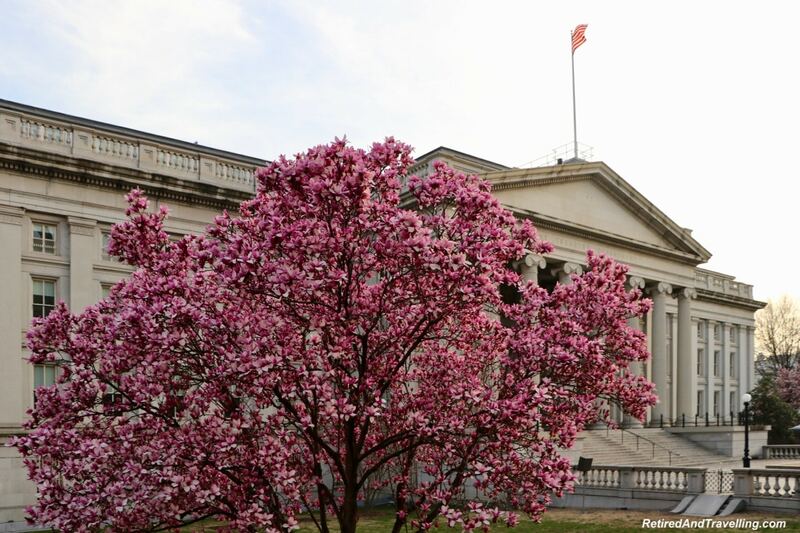 We saw a lot of blossoms in the heart of Washington DC. 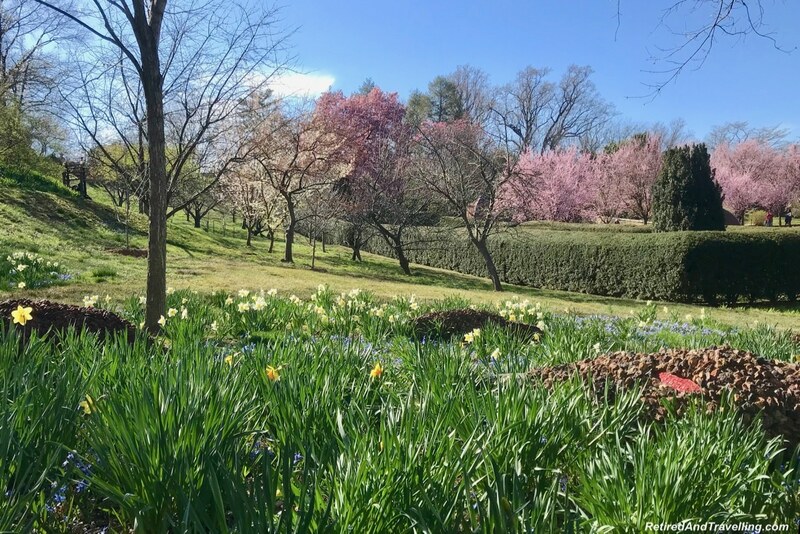 But one afternoon we headed to Dumbarton Oaks Gardens to see more. The grounds had a wide variety of trees in bloom from white through pale pink to deep fascia in colour. 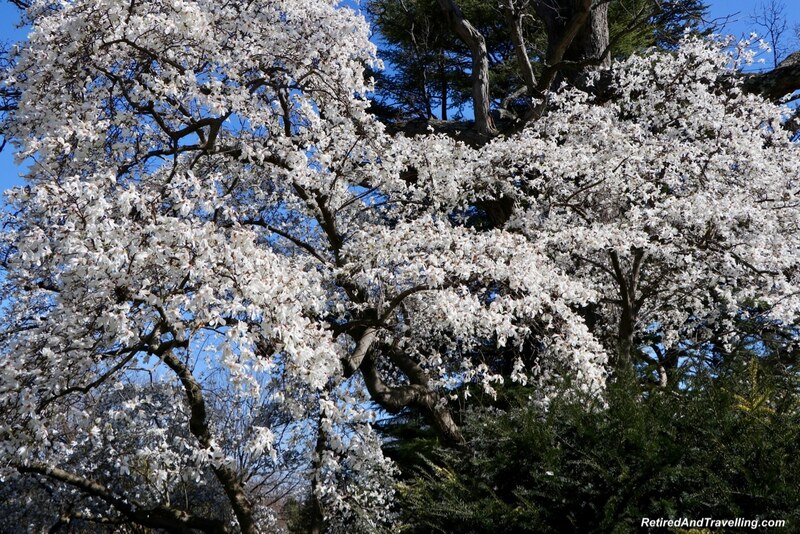 A walk through the gardens at Dumbarton Oaks gave us hope that spring might soon start to pop at home in Toronto. 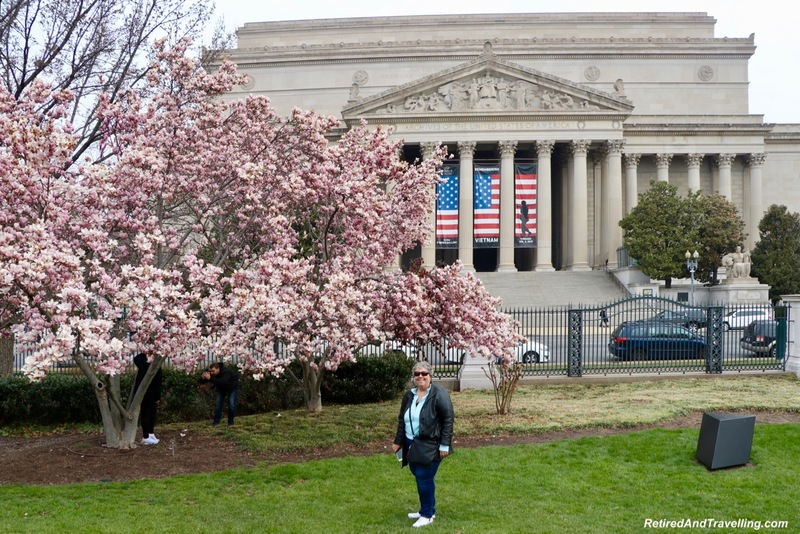 We were glad we headed to the gardens to experience cherry blossoms in Washington DC. If you are an early riser, you can catch the blossoms with a very different light. One morning David headed out before the crack of dawn. 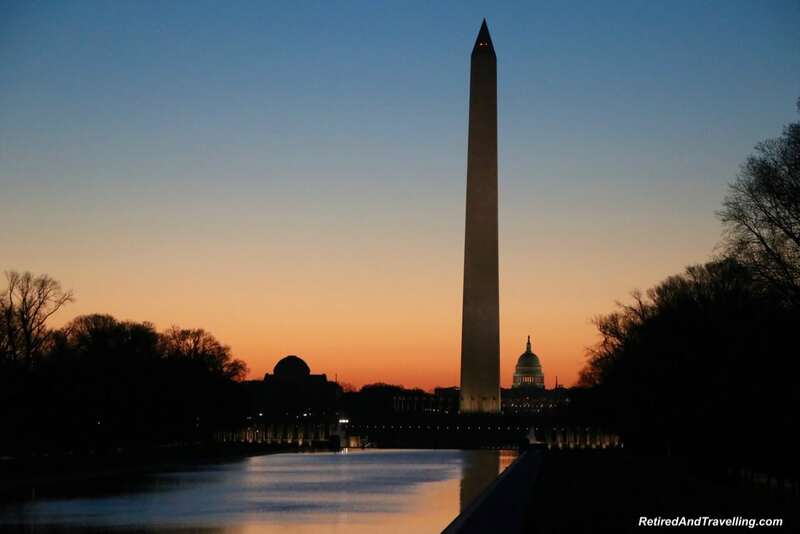 He captured the most amazing morning views of Washington. But he also caught the blossoms on the trees with that golden light just starting to brighten them. 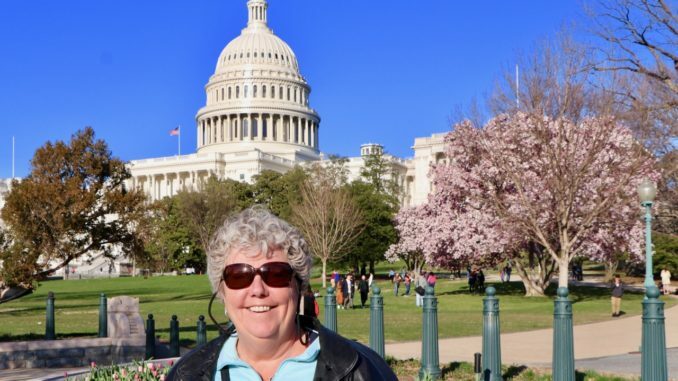 We spent some time with a fellow blogger Nicki when we were in Washington. She was a great help in directing us to the spots we had to see. 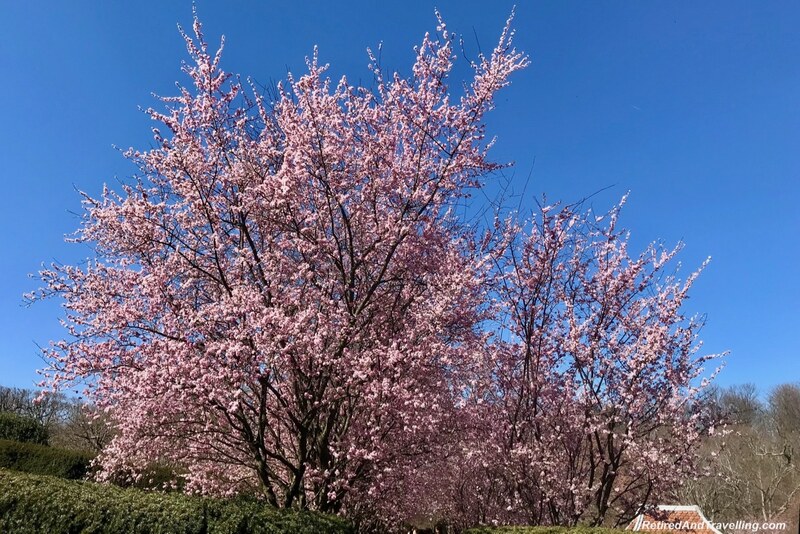 We missed the peak season for cherry blossoms, but I eagerly watched Nicki’s Instagram feed for some more blossom eye candy. She did not disappoint. The sunset picture she caught was just perfect! If you are looking for different lights to experience cherry blossoms in Washington DC, make sure to plan for sunrises and sunset. 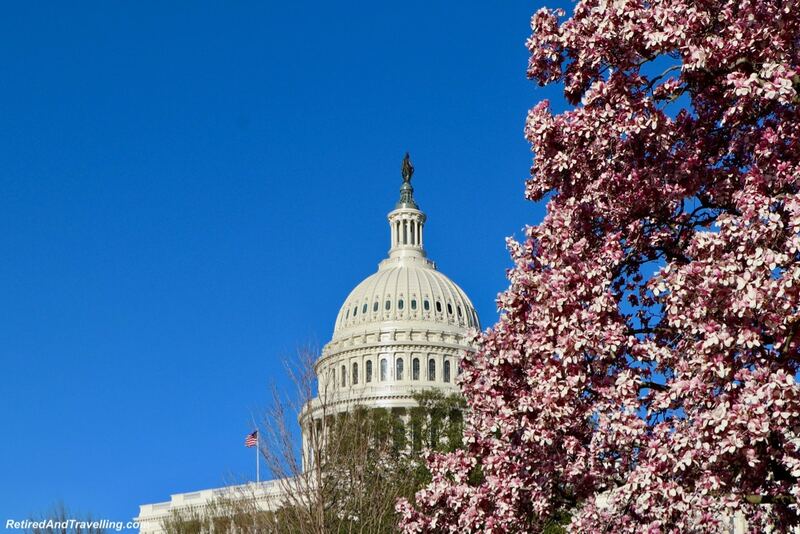 Timing your visit to Washington DC for peak cherry blossom season is a bit more of an art than a science. Especially if you have to plan your travel in advance. We booked our Washington DC visit about 5 weeks in advance. 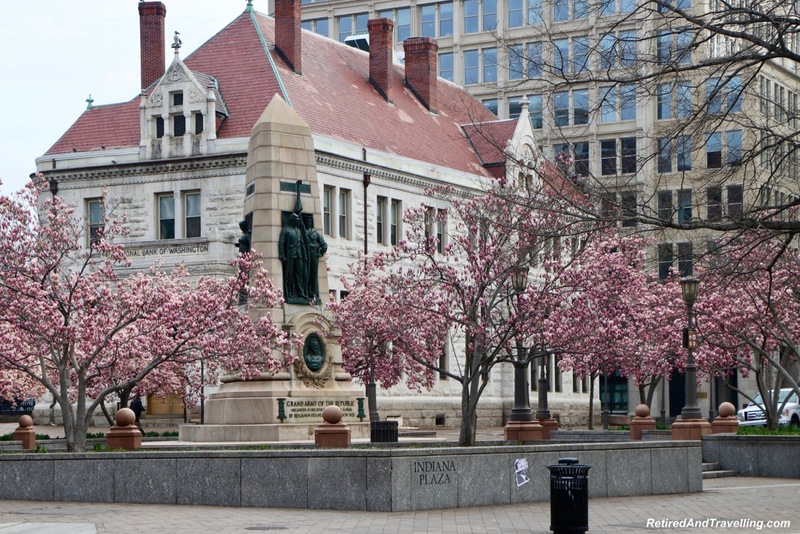 We knew that rates might be higher during the Cherry Blossom Festival. We did some research on the best time to visit and looked at web sites that predicted when peak season would be. Between the time we booked and when we arrived in Washington, the estimated date for peak season moved forward and back a few times. At one point, we would have been there right on the peak days. But Mother Nature is unpredictable and a snow storm pushed back the blossoms. We definitely got to experience cherry blossoms in Washington DC. But not at the peak. I watched peak season through Nicki’s lens. But we did see a lot of trees in bloom. They accented the whole town of Washington DC and the surrounding gardens. 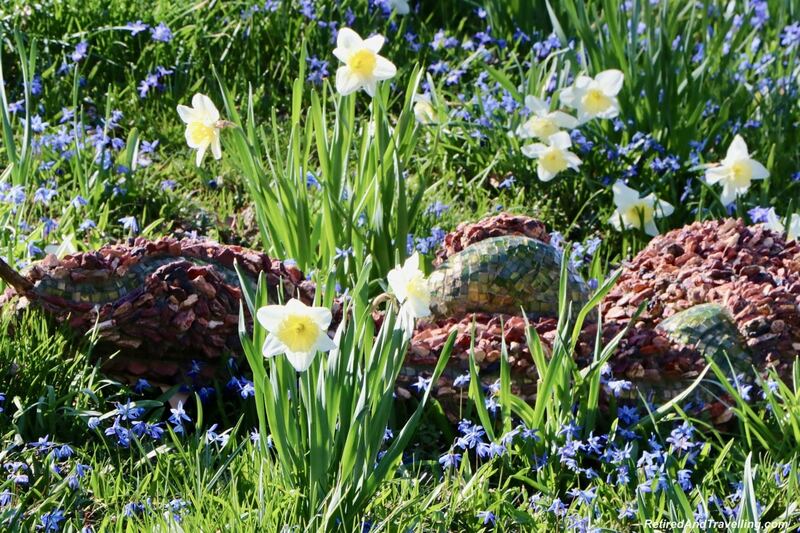 Several days were quite warm and the other spring flowers were in bloom. 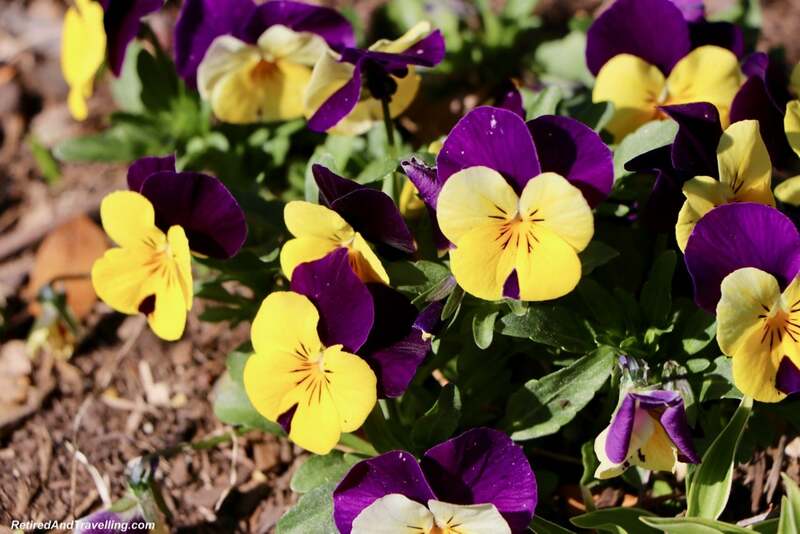 We were so glad we got this early taste of spring. 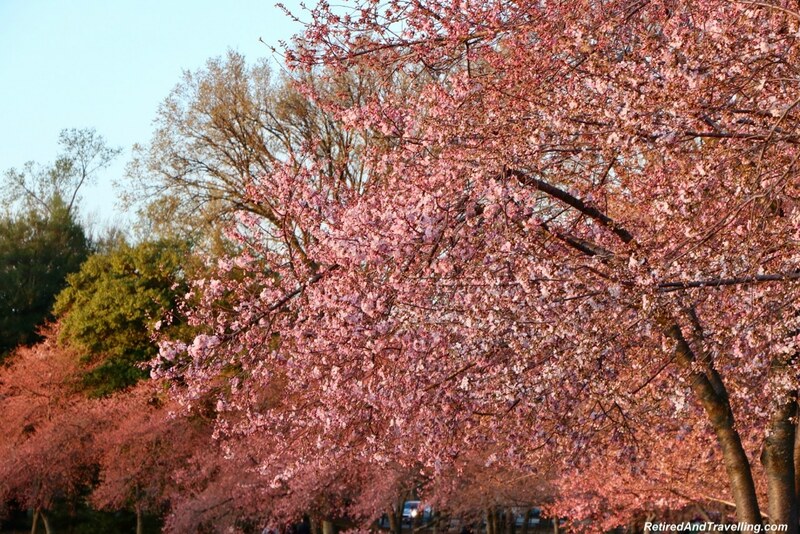 Did you experience cherry blossoms in Washington DC? 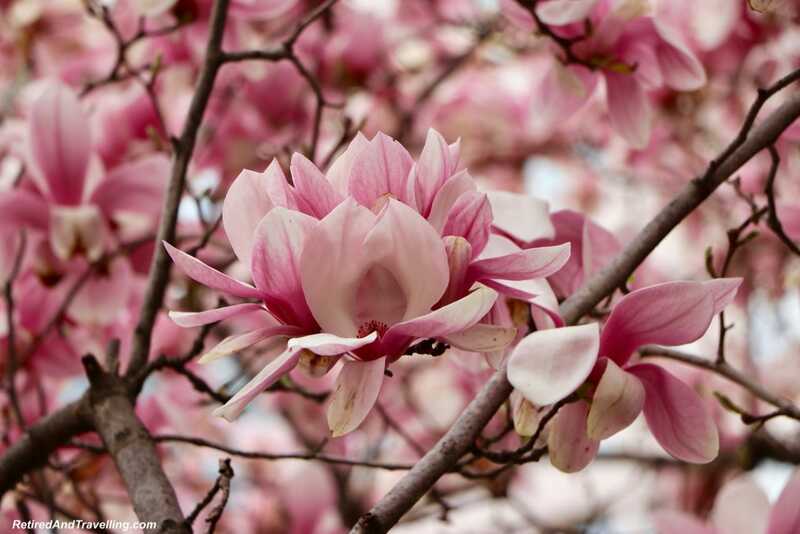 What advice do you have about timing or places to see blossoms?